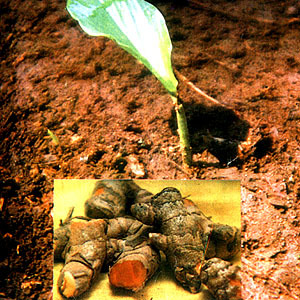 Turmeric, common name for an erect, perennial herb, of the ginger family, and for its dried rhizomes. It is native to parts of India. The pale-yellow flowers, borne in spikes, have a three-part calyx, a five-lobed corolla, a fertile stamen, two sterile stamens, and one pistil. The fruit is a capsule. The dried rhizomes are used as a yellow dye and as a food seasoning, especially in curry powders. Scientific classification: Turmeric belongs to the family Zingiberaceae. It is classified as Curcuma domestica.